Were you fired from work and your employer didn’t give you any reason why? 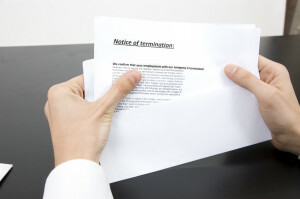 Do you suspect that it was an wrongful termination? Most forms of employment are seen as “at will,” which means that an employee can typically be fired anytime for no reason, as long as said reason isn’t illegal. However, there can be exceptions to this and you may be able to sue over the termination. Written: Perhaps you received a written contract on-the-job that promises your job security. You may have a contract that states you can only be fired with good cause or reasons stated within the contract. You may be able to enforce promises like these in a court setting. Implied: Implied employment contracts are exceptions to the at will rule as well. Most employers, however, are very careful not to make promises of continued employment. If permanent employment was promised, then you can take the steps necessary to prove this in the court. Courts may look at such aspects as the duration of your employment, the regularity of your job promotions, the history of positive performance, assurances that you would have continuing employment, and if promises of long-term employment were made when you were originally hired. What Are Breaches of Good Faith? If your employer acted in an unfair manner, then you may have a claim for a breach of a duty of good faith and fair dealing. Employers breach the duty of good faith by firing or transferring employees to prevent them from collecting commissions, misleading employees about promotion chances, fabricating reasons for firing an employee, and repeatedly transferring an employee to dangerous assignments to coerce the employee to quit. Some states, however, may require that a valid employment contract existed before employees will be able to sue for a breach of good faith. Discrimination and retaliation are illegal processes for firing employees. If you believe that you were fired for things like gender, religion, age, race, or color, then you may have been discriminated against. Retaliation occurs when an employer relieves you of your job duties because you filed a claim for some reason within the workplace. If you lost your job because of retaliation, there are some things you should prove. This can include the fact that you were engaged in a legally protected activity, that activity prompted your employer to act, and your employer’s action had adverse consequences for you like being fired (Repa). Federal law actually protects employees from retaliation. If you suspect retaliation is taking place, you should talk to your supervisor or a human resources representative about the reasons for these acts. If an employer isn’t willing to admit wrongdoing or correct an issue, then you may have to take your concerns to the Equal Employment Opportunity Commission (EEOC) or your state’s fair employment agency. The EEOC works to investigate the problems and protect your rights from being fired or demoted unfairly. You have a right to speak up (Guerin). The fact remains – you could be fired from your job for no reason. However, in some situations, this may be seen as illegal when you should have been protected. In these cases, it is in your best interest to file against your employer with the help of an experienced attorney that can help you understand your case. Call to speak to an attorney from RAWA Law Group your consultation is free. You can also fill out and submit our online contact form available 24/7 directly from our website. Barbara Kate Repa. Nolo, 2015. Web. Accessed Nov 15, 2015. Lisa Guerin. Nolo, 2015. Web. Accessed Nov 15, 2015.